By the expression “Bourbon Sites” we mean those territories that where directly acquired by the Crown under the kingdom of Charles first and Ferdinand IV later. They were usually farmhouses rich in vegetation, natural pastures, game, leisure activities such as hunting and strolling. 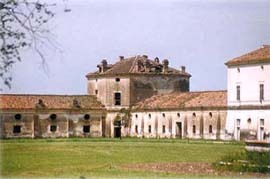 One of these farmhouses, perhaps one of the most charming if not among the most famous (it was called “Royal Delight”), is the Royal Site of Carditello, near San Tammaro, south of Capua. 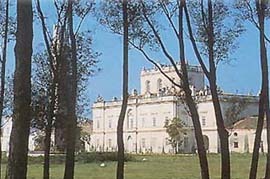 The territory, once exceeding 1000 hectares, was the property of the Earl of Conte d’Acerra. 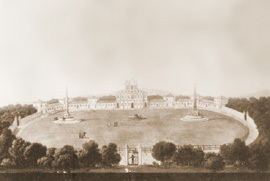 In 1745 King Charles wanted to buy it because it was good for hunting (the marshes of those areas were the ideal habitat for some species of birds such as pheasants and woodcocks; and it was not unusual to find there wild boars, foxes, hares and even deers) and for breeding both horses and buffalos, the latter producing (then and still now) the milk necessary to manufacture the mouth-watering mozzarella-cheese famous all across the world: in fact a dairy factory was immediately built there. In the middle of that land there was a “farm” called “The Forest”, a barn and a hayloft, a wharehose for different agricultural products. 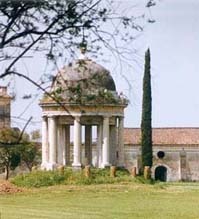 As for San Leucio, this original construction was transformed into a real “royal lodge” to house the Court in hunting times. Architect Francesco Collecini, who was already working at the Belvedere of San Leucio, was tasked with that work too, although the design supervision was under the direct lead of Vanvitelli. However, Ferdinand IV was the one who decided to complete the construction and start to use the farm. After 1784, the stables, stub, houses for the farmers, the stables for the buffalos, the tower where dairy products were manufactured, the barns etc. were built. parties and horse racing and at its back two vast squared areas were added. The entire estate measured 1750 hectares. Ferdinand wanted to counterbalance “Carditello” and San Leucio, since, unlike the innovative experience of the latter, the former had to stress his adhesion to the old agricultural policy. The whole area measures about 300 metres of length and is formed, as said above, by a central two-storey construction, very elegant and simple, and two lateral constructions linked to the main construction through two vast halls; however, each room was strictly connected to the others, just to show the absence of barriers between the Court and the community. Kitchens, the armoury and the personnel rooms were located at the ground floor. Two symmetric staircases led to the first floor, where the Royal House was housed and there was a salon for the parties organised after the hunting. The small chapel is of particular interest: its typically eighteenth-century style, its decorations (as those of the main constructions too) made by the major artists of the Court, among which Philip Hackert (frescoist and decorator of the Royal Sites). Some tapestries by Pietro Durante upon a design by Fischetti decorated the main salon, whose ceiling had been painted by Fischetti. This site, as many others, was abandoned after 1861 and fell into ruin (even cases of “political iconoclasm”, since frescoes depicting the Bourbons were scraped off). The site has been partly restored and since 1978 is open to the public; it also houses the Museum of Peasant Civilisation.